Two 200mm dia. medium band interference filters. 270 mm dia. medium-band interference filters. 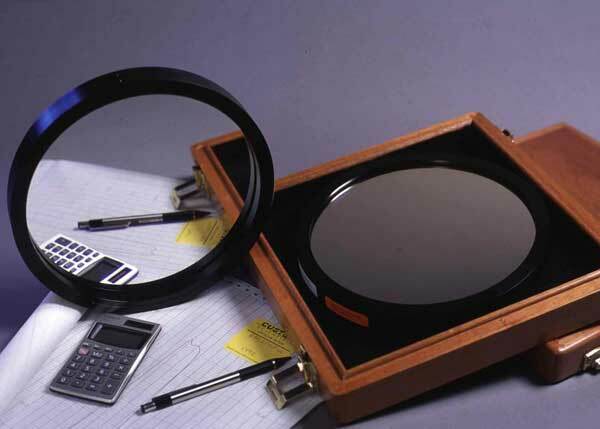 Since the advent and widespread use of CCD detectors in the 1990's, research astronomy has depended upon optical filters to obtain accurate, calibrated, and astrophysically interesting measurements. 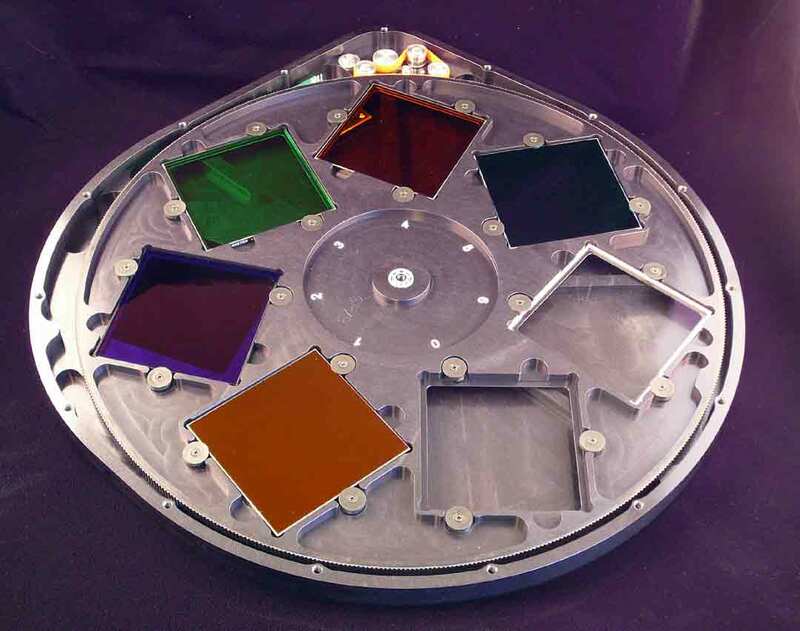 Whether obtaining images for broad band photometry, mapping narrow band emission line distributions, or obtaining spectral energy distributions in spectroscopic instruments, reliable, high quality, precision optical filters are a key component of the instrumentation. 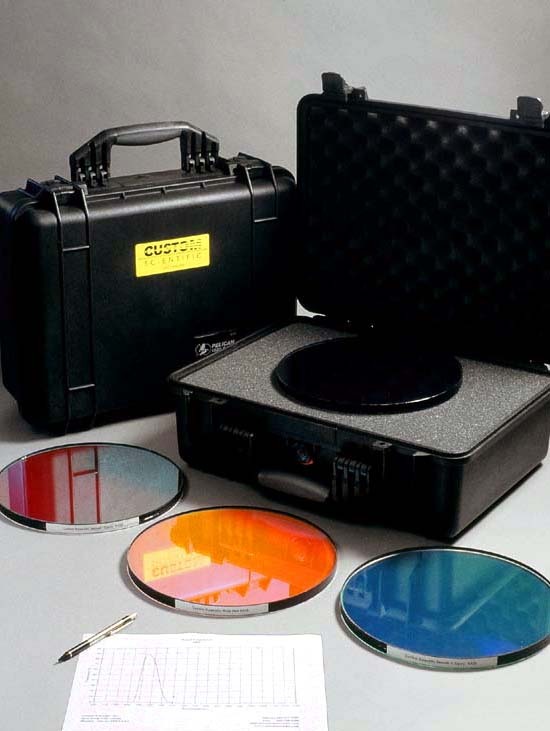 Custom Scientific, Inc. has been dedicated to supplying research astronomers around the world with such optical filters and other optical components since 1990. Members of our team have worked on filters for a wide range of astronomical installations including WFPC/2 that is now in orbit in the Hubble Space Telescope. We have played a principal role in developing and refining many of the photometric filter systems in use today, including Johnson, Cousins, Bessell, Stromgren, Thuan-Gunn, Harris, IRWG Young-Milone, SDSS, tri-color RGB, DDO, Vilnius and BATC among others. 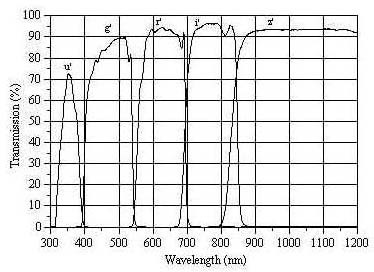 Each filter is shipped with its own transmission spectrum in analog or digital format. 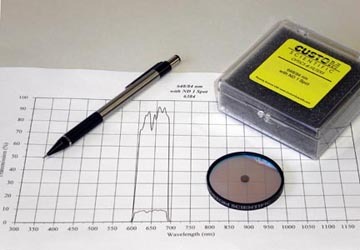 As CCD's have increased in size, and as cameras are utilizing ever-larger arrays of CCD's, the requirements for filter sizes are increasing. We are very experienced in these large format filters and some examples are shown on this page. Also, please note that we also make mirrors, beamsplitters, dewar windows and many other optical components. Send us your specifications and we will send you a quote. 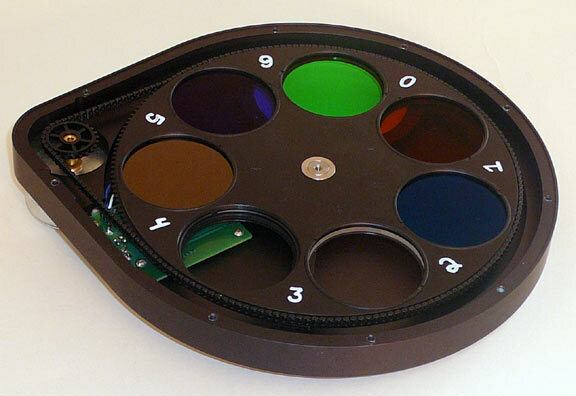 We do not have a published price list for the these optical filters because so many astrophysics observing programs tend to have custom requirements such as wavelength, bandwidth, redshift, size, and shape. Therefore, for pricing please contact us and we will quote you pricing based upon your specific requirements. 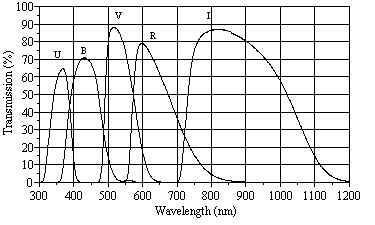 If you want to consider lower-cost filters that are usually in stock, please check our list of standard filters, which includes the most common photometric and emission line bands in common sizes. A 50mm dia. 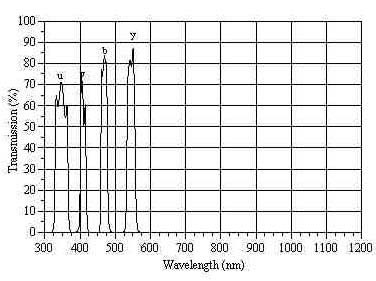 medium band interference filter with a small, circular coated spot in the filter's center which is a calibrated neutral density coating (ND1, T=10%). 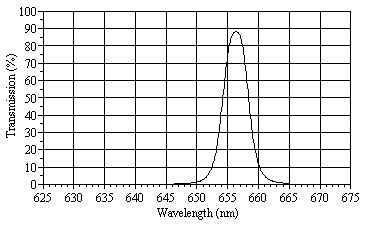 Note how the graph in the photo shows the transmission through the part of the filter without ND coating (T>90%) overlaid with the spectrum through the part of the filter with ND coating (T=10%). The filter is located near a telescope focus plane and the neutral density spot can be positioned to reduce the intensity of a bright star by 90%, yet allow full transmission of objects close to the star. 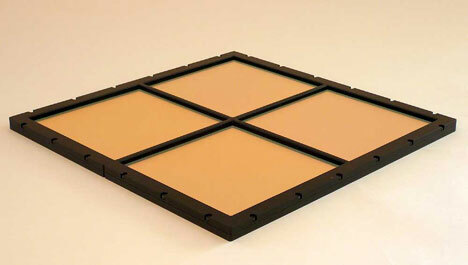 Large size, narrow bandpass filter, 12 x 12 inches (300 x 300 mm). 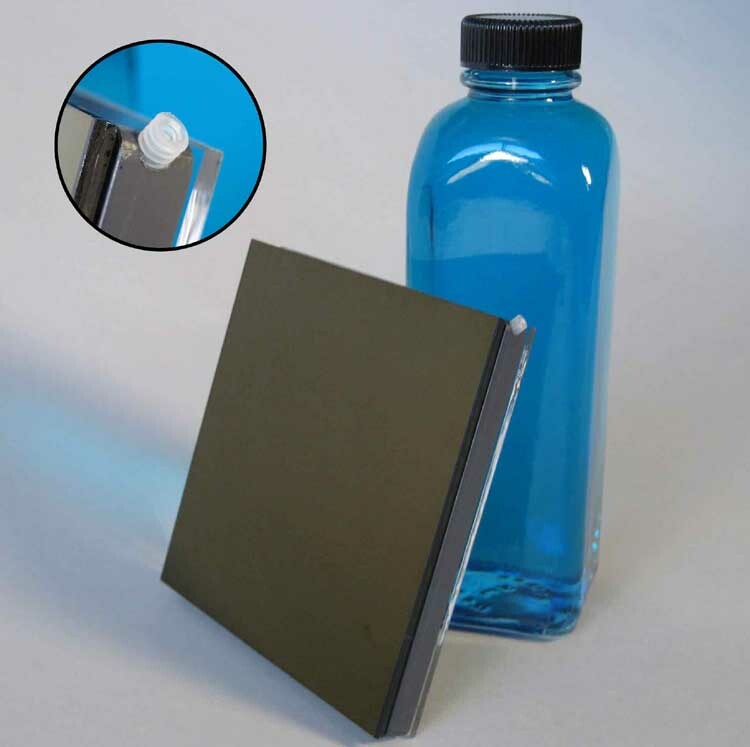 Due to the narrow bandwidth of this filter, it was fabricated as a mosaic of four elements 150 x 150 mm each and mounted in a custom- machined aluminum frame. Rectangular narrow bandpass filters for the M2FS multi-object spectrograph. 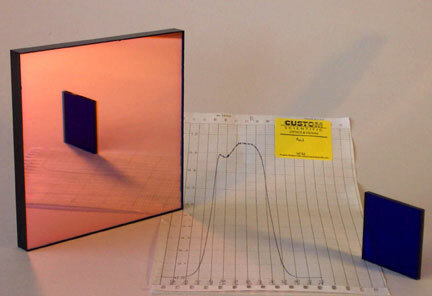 A 160x160 mm bandpass filter (left) and a 50x50 ultra-violet filter (right). Interior of 7-position, automated filter wheel for 80 x 80 mm filters. Large narrowband filter in custom mount. 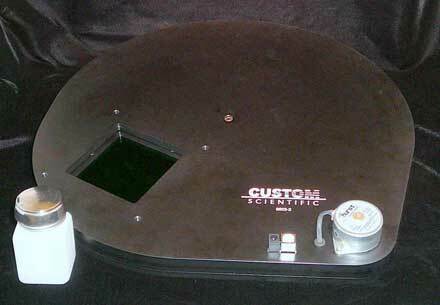 Exterior of 7-position, automated filter wheel for 80 x 80 mm filters. Gold coated, λ/10 mirrors. 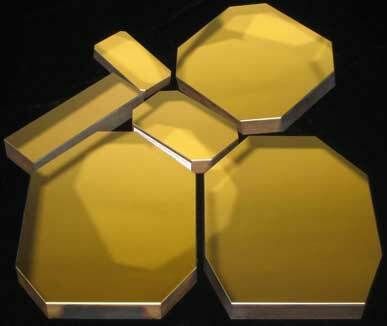 Gold mirrors have high reflectivity in the infrared. Housing and contents for liquid CuSO4 filter. 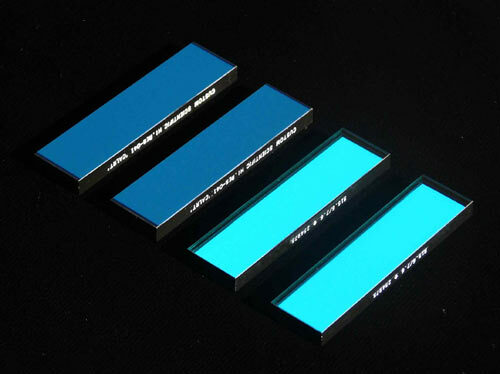 This combination of glass UV optical filters forms a hermetically sealed cavity that holds a volume of blue liquid CuSO4. 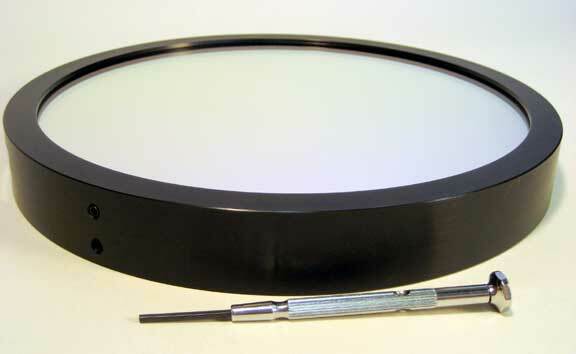 This unique assembly provides a UV filter that has high transmission in the ultraviolet and good blocking of unwanted visible and near infrared light. Photo inset shows magnified image of nylon set-screw that seals hole used to fill cavity. When filter is filled, set-screw would be hidden inside filter housing. A jar of CuSO4 is in the background.